He loves the defence industry, the aircraft, the undercarriages, engines, landing gears, and this is what brought him to Cobham, a company engaged in the development, delivery and support of leading edge aerospace and defence technology and systems, for more than seven decades now. A.J. Stevens, Chief Executive Officer, Cobham, in an interview with SP’s Team, he outlines the company’s core business interests in India. SP’s: Can you underline the core competencies of Cobham? Stevens: Cobham is a diversified company and has a wider portfolio. The company was founded 76 yrs back by Sir Alan Cobham, who was an aviator himself and had a great passion for flying. The company was the pioneer in air-to-air refuelling solutions and today has the fifth generation of air-to-air refuelling solution. For many years, the company manufactured hardware products but when the founder’s son Michael Cobham came in, the company got into aviation services as well. It was he who pioneered the electronic warfare training for the air force and navy. I am the sixth generation CEO and even today we have some interesting people in the organisation who are equally passionate. SP’s: Can you elaborate on the helicopter training programme of Cobham? Stevens: Today, in UK, every helicopter pilot regardless of which service (Army, Navy, Air Force he/she comes from is trained by Cobham. Both the royal prince—Prince William and Prince Harry have already undergone rotary pilot training and now Prince Williams is undergoing training on search and rescue. SP’s: What are the other programmes outsourced to Cobham by various governments? Stevens: The other programme in which Michael was heavily involved in is the coast guard contract in Australia—the protection of the border of Australia. Our aircraft with electronic components protect the border 24/7 all 365 days. Multi-tasked, they do search and rescue, look for bad people, drugs. Cobham has the ability to work very closely with governments. It is great responsibility and protection of a country’s perimeter is very crucial. So I make sure that the contract is appropriately managed. We work with 10 different government agencies, all under the Border Protection Board. Besides the air element, the ships also have our equipment like antennas. We can provide similar coast guard protection in other countries including India. We have the business model and many years of experience too. SP’s: But in India military flying training and operations are under the domain of the services. Stevens: Yes, but things may begin to change in 10-15 years from now. SP’s: Are you not into the MRO sector? Stevens: No exactly, but we do have the conversion capabilities. For example, the tanker aircraft, A330, has been converted for the UK Air Force. We convert many aircraft for military applications and on certain military aircraft we do specialised engineering work. We also have been selected by Boeing for air refuelling components for the US tankers. Cobham protects the intellectual property of its customers and does certain specialised engineering services through its strategic business units in the US. SP’s: Who are your competitors in the west as far as the air-to-air refuelling business is concerned? Stevens: Swiss Industries have developed a product and has been taken on board by General Electric. They were supplying to Boeing, but the contract has now come to Cobham. Today our revenue is two billion pounds and our aspiration is to continue to invest in the next generation technology across our portfolio. We have nine strategic business units; one aviation, one engineering, and the other seven are product specific. We have broadly divided it into three sectors—defence, homeland security and commercial business, each run by an expert, who understands the technology and knows who the competitors are. With regard to the commercial sector, every Airbus aircraft have our products and we have started supplying to Boeing, Bombardier, etc. The security sector, which is a growing business, is fragmented and we have the ability to track things and people, and have the ability to monitor voice, video, etc. In the defence sector, we operate in marine, in land, and we have a good capability in space as well. SP’s: How does it feel sitting at the top? Stevens: Having worked in different companies, I have experienced both centralised and a decentralised control and so I have picked up the best of both. Over the last 10 years, Cobham has had more than 50 acquisitions having different work culture. My job is to try and shape the future of the business picking good elements from all. We have broadly divided our nine business units into three different sectors and there are three different Presidents. They take a lot of the day-to-day workload from me. We operate in many countries around the world—India, South Africa, Australia, France, and Scandinavia. I ensure that there is good governance at the business units—good visibility of processes, procedures. We are very happy to invest and we are looking at top line growth. We look forward to more acquisitions and we want to differentiate ourselves by providing not just good operational but also good technical solutions. 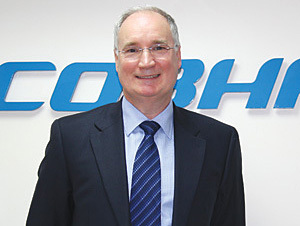 SP’s: Can you throw light on the core business interests of Cobham in India? Stevens: We are committed to building a long-term arrangement in India. Besides strengthening our relationship with our existing partners like Hindustan Aeronuatics Limited (HAL), we are also looking at partnerships with both public and private sector companies in India. Cobham has a great portfolio over land, air and sea and has the ability to plug and play with whatever system is on board. We are looking at all the three areas—defence, security and commercial business. India has great potential and we want to invest more in the country including in technology. It is a complex job to find appropriate partners whether they are defence public sector undertakings or private industry players. Through our outsourcing team, we want to tell the customers globally that if you want good quality product in this particular area, here are a few companies in India with whom you can build a long-term relationship. We are looking for partners with whom we can develop next generation solutions. SP’s: Do you have any companies in mind? Stevens: Not at this stage. There is a very long list and the good thing is that there is a lot of choice. India is very rich in terms of technology. We are not just looking at a single programme but a long-term relationship. Experts from the company would come together and make these marriages. We have systems and subsystems, tanks to transport aircraft, and I think it would add to India’s strength. 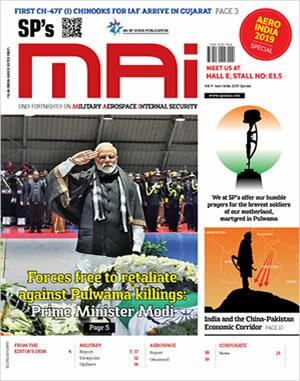 We have a good history with HAL, ordnance factories, shipyards, etc. We have critical technologies which we have spent many years and dollars developing. Cobham can transform the life of a 19th century helicopter into a 21st century one. SP’s: What is your contribution on the LCA Tejas programme? Stevens: We are working with the Aeronautical Development Agency (ADA) on a number of products in LCA—weapons carriage, life support system and also the requirement for a refuelling project, static and fixed. Now with a team based in Bangalore, we will be much closer to the ADA and understand their exact requirements. SP’s: Are you responding to the RFIs or RFPs issued by any of the three services? Stevens: Yes we have responded to the request for information (RFI) issued by IAF for search and rescue operation. The products are emergency locator transmitters and unmanned aerial vehicles (UAVs). Cobham has a rich chest of capabilities. We already have good links with IAF, we have already provided buddy refuelling for Su-30 which is very successful. We are working with the IAF on future requirements. IAF’s C-130J can be transformed into a refuelling tanker. We can provide the technology to transform C-130J into KC-130J. Similar requirements would be needed in helicopters. We have refuelling solutions for any aircraft the IAF currently has and plans to acquire in the future. We also provide refuelling for unmanned aerial vehicles (UAVs). SP’s: You are spending a considerable amount on research and development? What is the latest that you are focusing on? Stevens: Besides traditional programmes like air-air-refuelling and weapons carriage, we are bringing in a lot of effort on command, control, communications, computers, intelligence, surveillance and reconnaissance (C4ISR). We are looking for good engineers who can contribute towards developing better technology. The other area we are highlighting on is communications. Cobham has a range of products that we ship around the world and I think there is a need for such products in India too. SP’s: What about unmanned refuelling? Stevens: Cobham has been selected for unmanned air refuelling of Global Hawk. There may be similar requirements elsewhere. We are also working on new technology for unmanned refuelling. SP’s: Are you looking at the homeland security market in India as well? Stevens: Yes, we are in dialogue with various national level security agencies in the country and have varied products on offer for them. We have competence in coastal security and surveillance, integrated force protection, bomb detection capabilities, SATCOM solutions, etc. We have antennas which can be placed on a truck and is an instant communications solution in areas hit by natural disasters like tsunami, etc. Part of the solutions that we offer for homeland security is putting a mesh over an area, say in five blocks in the US or in London or in Delhi. We did that at the Olympics in London and we may have it at the royal wedding that is coming up.